Support Guinea Lynx in 2018! 2018 is here! Hopefully it will be a whole lot better than 2017 (in ways too numerous to count!). Oh, and let's hope it's good for our guinea pigs, too! Guinea Lynx is 19 years old now, a great place to talk about guinea pigs and more. Some content has been available since 2000, hosted on another site, moved to another temporary host (thanks, Teresa!) and finally to its own site here. The current board dates back to 1/1/2002 (there was a temporary board before that). For those of you who value Guinea Lynx and all it has to offer, I encourage you to help support the site. Since I am no longer selling calendars and books, I no longer have the buffer I once did to cover basic costs. You can write me for my address if you need it, or can use Paypal (see tips below) . Your support is appreciated more than you know! I remain firmly committed to keeping Guinea Lynx Google-ad-free (THIS is what Guinea Lynx could look like without your help: http://www.guinealynx.info/sample.html ). So if any of you are willing to help cover the basic costs associated with running this board (hosting/internet, etc.) which have unfortunately increased, your donation would be greatly appreciated. While contributing to expenses is voluntary, it really does keep this site going. And if you have never contributed, perhaps this could be the year you start! I would be happy to give you a line of text (or update your notation) as a thank you for your help. Choose whatever notation you'd like - make one up or try "Supporter in '18". Notations appear under your avatar. If you don't have an avatar, send me a picture of one of your guinea pigs and I will size it so you can upload it to your profile. For a $40 donation I will be happy to make you an animated avatar (up to 9 guinea pig pics). An existing animated avatar can be updated (new pics) with any donation. If you email me at the following address, I can send you my mailing address if you wish to send a check (preferred). For those who would rather use Paypal, I only have a personal Paypal account (it doesn't take credit or debit cards). For what it's worth, mailing a donation works better for me. You all make this board a real community and I'm grateful for your participation here. I am especially indebted to the members who answer questions about guinea pig care and monitor the medical board. I am so proud that you all make a difference in the lives of guinea pigs and in each other's lives - sometimes in wonderful and unexpected ways. And you all absolutely provide the inspiration I need to keep me going so thanks for making Guinea Lynx the great place it is!! •	We will pay you via Paypal once the article is live. 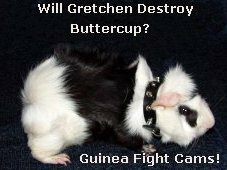 I wonder what Gretchen would say? OK, done! Check is no option here, as our countries bank system cancelled the check system entirely, except bank created ones for paying for property. I need no change in text. And thanks so much for doing such a great job! Could you bump my tag line to 2018? Thanks, Lynx! Thanks so much, pigjes and mmeadow! Your donations really help! I'll go update your notation, mmeadow! No need to change my tag line. I'm a slacker but I've sent you a little something. Thanks so much! This will help make a dent in the expenses! I've also sent a small check. Oh, and can you make mine say "supporter in 2018" instead of "armcavy", please? Thanks, Lynx! You are an International Treasure! I would be happy to update your notation if you'd like, when it gets here. I am forgetful and may need reminding but will do my best to remember!! And thanks for your continued support! Ah, I remembered (to update your notation)! Thanks again, GrannyJu1! You are wonderful. And so appreciated! Just sent a small donation via paypal (i'm almost outta paper checks at the moment). I haven't officially logged in for years, but I've been referencing the site and boards all the while for the best info possible to take care of my pigs. Thank you so much for everything you have done and provided to all of us! Thank you so much, KateNelson! I was going to send you an email thank you. I am currently cutting expenses as much as I can to avoid "being in the red". Your donation definitely helps! Let me know if you'd like a notation under your name ("Supporter in 2018" or something else). Lynx, I just noticed my avatar is missing. Do I send you a new file? Hmm, let me go see what is wrong. Did you change anything? I should be able to get the most recent one uploaded. I can't figure out why it is not showing. After dinner I will try to remember to delete it and upload it again (this is tricky because there is a size limit and I have to change the size limit to allow it and change it back afterward). I am guessing this is a hold-over from when the site was updated. Although I had the settings correct, it would not allow me to specify a remote location. When I looked at my avatar, it seemed to have been uploaded. So I did that with yours too. When I don't do things for a while, I sure forget how to do them! Feel free to update your pics if you care to. I'll have to see if I have some photos that will look ok, before I have you downsize my avatars, going from 5 pics to 3. You are so good to us, Lynx. Thank you again. I was thinking the update might have changed things too but unsure! It is not on the same page as the avatar info. Not much but I sent a little something as a thank you for the help and reassurance this site has provided since I became an unexpected Guinea Pig minder a few months back. As I have said before I wish I had discovered this site sooner as it may have helped us save Mu Mu or at least make her more comfortable while she was with us. Will try and see if I can send a bit more later.